Useful rough angular measurements for assessment. We have already referred in previous articles to the remarkable concordances that make possible the fact that the Sun and the Moon appear of comparable size in the sky as viewed from Earth. But other factors need to be taken into account in order to explain the relative frequency of eclipses featuring the three bodies. Again, we have brushed on these in our discussion of the March 20th solar eclipse when referring to the alignment of the three bodies: Earth, Moon and Sun. The Zodiac is defined as those constellations through which the Sun appears to pass (as background and seen from Earth) during the course of one year. The apparent path described by the Sun's centre is called the Ecliptic. 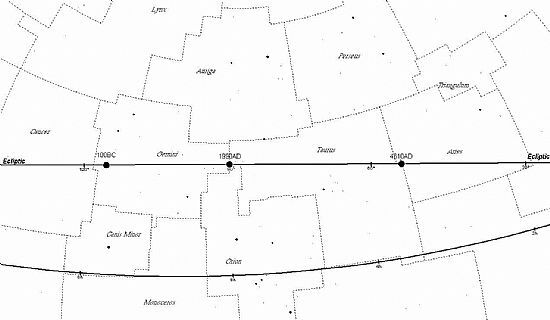 When this line is projected onto a map of the stars we see that in fact the Sun passes through thirteen constellations and that one of these, Ophiuchus, is not a named zodiacal constellation, despite the fact that the path of the ecliptic through this constellation is longer than it is through neighbouring Scorpius. The reason for the omission of Ophiuchus from the regal twelve has more to do with a desire for symmetry than with fact. If now we examine the apparent movement against the star background of the Moon and planets, we find that they too follow closely the path of the Sun in that they tend to lie close to the ecliptic line. This is because these bodies follow paths in a similar plane that, projected into space, represents the plane of the Earth's own orbit. Put another way, as seen from the Sun the planets (the Moon is a satellite of the Earth remember) all follow paths (orbits) falling in the same plane. There are slight departures from this, of course, notably by planet Mercury, and, to a lesser degree, Venus and Saturn. The implications for our eclipse data is that because the Moon too conforms to the above strictures to a greater or lesser extent, the alignment of the Earth, Moon and Sun occurs more frequently than if the Moon were to stray far outside the Zodiac. On Earth we appreciate a solar eclipse as when the Moon passes in front of the Sun, but from the Sun's perspective such eclipses are represented by the shadow of the Moon passing over the Earth's surface. On the other hand, lunar eclipses seen from Earth feature the shadow of the Earth passing over the Moons surface, or the Moon passing through the Earth's shadow (all these shadows effected, of course, by light emanating from the Sun itself). And there is the important distinction to be made between the shadows cast by the two bodies: in contrast to the Moon, the Earth has an atmosphere so that sunlight will be refracted around the limb of the Earth producing a variety of lighting effects within the umbral shadow as seen on the Moon. These effects are unpredictable and will depend upon the condition of the Earth's atmosphere in the refracted zone at the time of the eclipse; they are often quite subtle ranging from a bland orange to coppery or bronze tints within the umbral phase of the eclipse. Of the three bodies, the Sun is responsible for the light causing these shadows, but the Earth differs from the Moon in not only being approximately four times the latter’s diameter, but in having a significant atmosphere: the Moon has no sensible atmosphere. And so the shadows from the two bodies differ since in the case of the Earth a good deal of light is both refracted and dispersed by our planet. However, both the Earth’s and Moon’s shadows are what we call compound shadows (dia. 1). Were the Sun to be so small as to present a point source of light then the Moon would form a simple shadow (dia. 2). The Earth, however, due to its atmosphere, would still generate a compound shadow. Lunar eclipses occur more frequently than solar eclipses because the Earth is larger than the Moon by a factor of 4:1 (in diameter terms), as already noted, and therefore casts a larger, longer shadow. 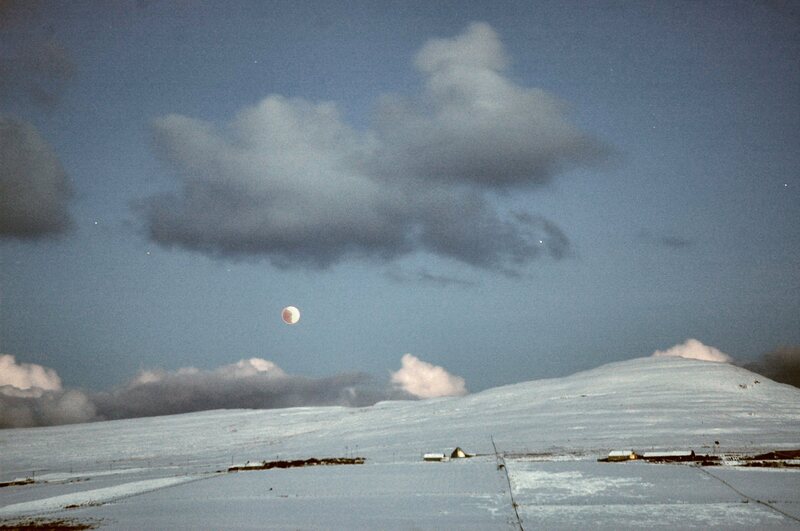 We were fortunate on Rousay to have observed the total lunar eclipse of 2007 March 3/4 in its entirety. A booklet on the observations made from the observatory site was published, a copy of which may be viewed in the Orkney Library. The lunar eclipse of 2010 December 21 imaged from Braes, Sourin, Rousay at 07h 52m. Sunrise took place before the end of the eclipse. Dia. 1: Complex shadow features. In this crude representation of a Lunar Eclipse, not to scale by any means, the Moon at mid-eclipse is represented by the dark circle at ‘M’ totally submerged in the umbral shadow. As explained above, this shadow is never entirely devoid of light. Dia. 2 Umrbal shadows by the Earth and Moon. The diagram is not to scale but simply illustrates roughly the comparative scale of the shadows cast by the two bodies. For clarity, the punumbra have been omitted from the diagram. Moreover we have represented the Sun here as a large circle: the umbra will only appear without the penumbra when the light is from a point source, as previously stated. It appears to be assumed by many (the UK weather forecasters and the broadcasting media in general) that equinox and solstice occur on the 21st day of the months March, June, September and December of each year. This is far from the case in fact. The reason why these events appear on different days from year to year has to do with the Earth’s orbital movement about the Sun which does not conform to the calendar we have constructed for civil convenience. The reasons for this false assumption are more difficult to fathom but may have something to do with rumour—it may be easier to replicate than to go to the source for reliable information! Let us look at the subject in a little more detail. The requirements for a workable calendar are essentially the same as that for any timepiece used to calibrate the day. Of course a calendar is not a clock as such for a clock registers the passage of time whereas as calendar serves to provide a working schedule in our daily lives from year to year. Clock time and calendar events are obviously linked since both are related to the rotation of the Earth upon its axis and the revolution of our planet about the Sun. Problems arise simply because the motions just described do not function evenly. Variations in the Earths rotation are not as significant as the loss of synchrony we have with the Sun throughout the course of a year onward. Most of us are aware that from time to time (phrase used advisedly) timepieces have to be adjusted so as to synchronise with real events taking place within the solar system. By this we mean, it would be of little value to have timepieces that keep constant time moving out of step with the events of night and day. We have discussed timekeeping with relation to "clocks" in some detail in previous articles, here we shall concentrate on the calendar. In the same way that the day is the standard with respect to the Earth's rotation (divided arbitrarily into 24 hours), so we have the year made up of days and months. As with most things, the calendar has been refined over many centuries to accord with our more modern, frenetic lifestyles. It is important to realise this since our ancestors were in many ways more in tune with their natural environment than we are today. Thus, calendars recognised not only the importance of the seasons in respect of agriculture etc. but due regard was also paid to the phases of the Moon: hence the term "harvest moon", for example. The Earth moves in a near circular path (orbit) around the Sun. We say near circular for in fact the form of this orbit is that of an ellipse. This means that the Sun's distance from us varies throughout the year brining us closest to the Sun at perihelion and farthest at aphelion. These are dynamic constructs and were the Earth to be rotating on an axis perpendicular to the plane of its orbit then these two points would probably serve as markers in the calendar. But the Earth's axis is tilted to the plane of its orbit departing from the vertical by approximately 23.5˚. 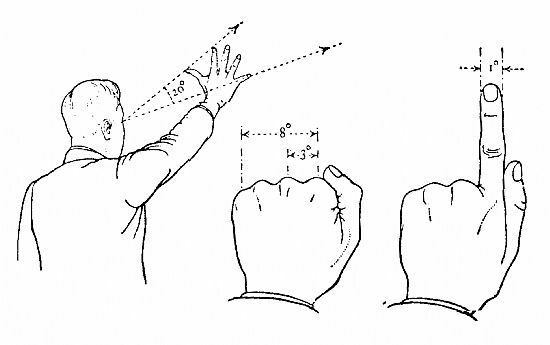 (See diagram below.) Since this axis point fairly constantly to the same some point in space throughout the year, the effect here on the Earth's surface means that when the North pole is tilted in the direction of the Sun (summer) in the northern hemisphere, that same pole is tilted away from the Sun from the southern hemisphere (winter) and visa versa. Thus we have what are called the solstices (Latin: solstitium, i.e. from a stationary point). At these points the Sun will have either a maximum altitude at apparent noon above the horizon (SUMMER solstice) and a minimum altitude at WINTER solstice. The two other points lie between the above when the Sun appears in the zenith at locations along the equator and gives equal noon altitudes in the respective north and south latitudes. These are referred to as the EQUINOXES (derived from the Latin aequinoctium implying day and night are of equal duration in hours NOT in hours of light and dark!). These events can be better appreciated if we were to imagine that the Sun could be seen against the background of stars during daylight. The path the Sun makes against the stellar background is referred to as the ecliptic and features what are called the twelve Zodiacal Constellations, or signs of the zodiac from the fact that the Sun appears to pass through the twelve constellations during the course of a year. There are in fact thirteen constellations involved with the Sun seen against the stars of Ophiucus between Scorpius and Sagittarius from November 30 to December 17. This fact highlights the complexity of the problem intruding asymmetry in the form of 13 constellations. It is the variability of events occasioned through the geometry and varying movement of the Earth that has made the task of the calendar makers so difficult. It is impossible to have lasting synchrony and so adjustments have to be made at regular intervals noted by the insertion of a leap year. The following table indicates clearly how the distribution of dates to the occurrence of equinox and solstice vary over the course of the next ten years. Summer solstice this year (2015) occurred on June 21 at 16h 37m UT. As per their annual ritual, media commentators and weather forecasters alike refer to summer solstice as the “longest day”. This may be anachronistic in intent or it may arise out of ignorance (astronomy, despite being the oldest of sciences, is less well understood today, in general, than it was 100 years ago). For whatever reason, the statement is a nonsense since the duration of the terrestrial day (Earth’s axial rotation) is to all intents and purposes constant. The notion that there is more daylight at the solstice is likewise sensibly incorrect; the time the Sun spends above the horizon at a given location varies little over the days leading up to and after solstice. This is because the Sun’s declination (dec.) day to day over this short period is minimal, in contrast to the period around the equinoxes. 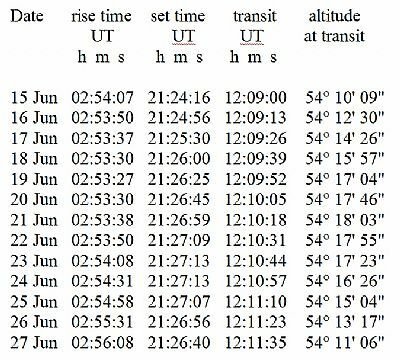 This may be understood from the table below giving the times of rising and setting for the Sun as viewed from the location of Kirkwall, Orkney, June 15 to June 27 2015, together with the Sun’s altitude at true noon for these dates. Solstice is defined as the instant at which the Sun reaches its greatest deviation from the celestial equator and occurs at so-called midsummer and mid-winter. (Note midsummer is of course hemisphere dependent.) Expressed another way, the Sun is at its maximum declination (north or south) at the solstices with a numerical value of 23° 26' 21.5" (epoch 2000). 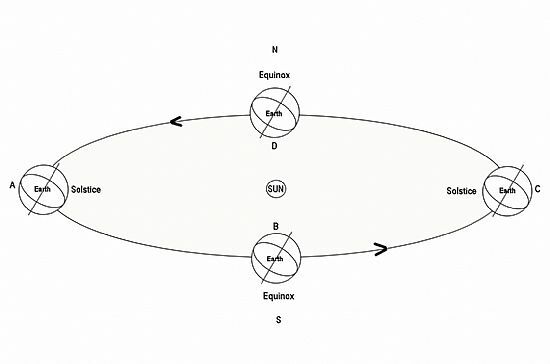 The figure derives from the inclination of the Earth’s axis to the plane of the Earth’s orbit about the Sun and is referred to as the Obliquity of the Ecliptic. The date for a solstice generally falls on June 21 (summer solstice for the northern hemisphere) and December 21 (winter solstice for the northern hemisphere) but may deviate from this by one day either way. 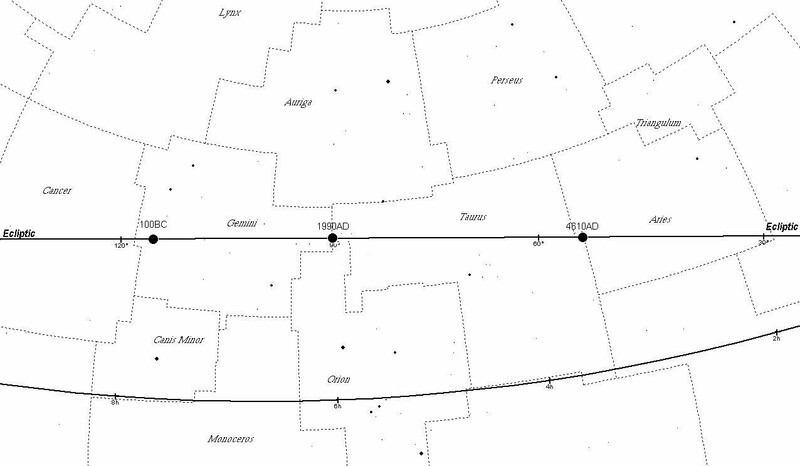 It is interesting to note that summer solstice now falls with the Sun in the constellation Taurus, close to the border with Gemini. The change over from the latter to the former took place in 1990. Summer solstice will continue to occur in Taurus until the year 4610, after which the event will transfer to the constellation Aries for hundreds of years into the future. The shifting of the Sun’s position at solstice is analogous to the phenomenon known as precession of the equinoxes and is produced by a slow, cyclical wobbling in the orientation of Earth’s axis of rotation, with a period of 25,772 years. In early times the Vernal Equinox occurred with the Sun in constellation Aries, hence reference to the “first point of Aries”. As of the present (2015) the zero for Right Ascension (RA) is in constellation Pisces. Precession was the third-discovered motion of Earth, after the far more obvious daily rotation and annual revolution. Precession is caused by the gravitational influence of the Sun and the Moon acting on Earth’s equatorial bulge. To a much lesser extent, the planets exert influence as well. Of course, the boundaries set for the constellations are purely arbitrary so that there is no physical significance to be attached to where the Sun appears against the background of stars. Dividing the stars into these groups is simply a method organizing their study from a human perspective. 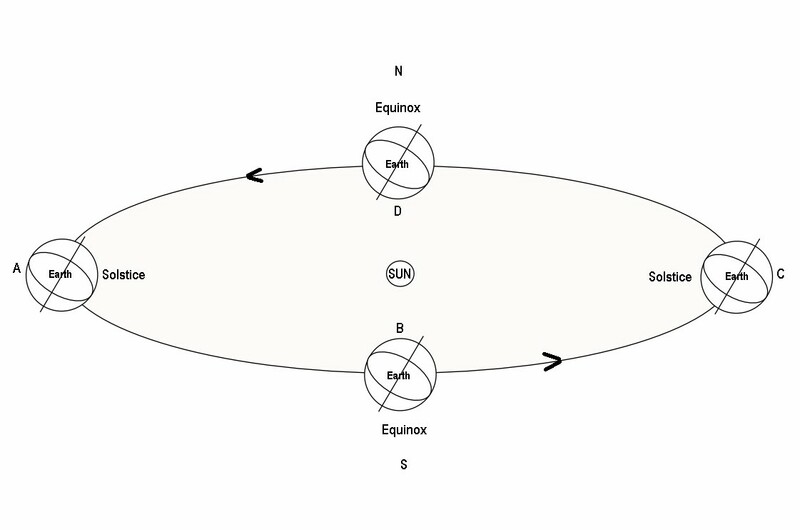 Diagram (not to scale in any sense) to show the occurrence of equinox and solstice. An equinox occurs when the Earth is in positions B and D. Summer solstice for the northern hemisphere occurs at A and winter solstice at C, and visa versa for the southern hemisphere. An imaginary line representing the equator projected from the Earth’s centre onto the inside of an imaginary sphere (the “celestial sphere”) is called the “celestial equator”. An imaginary line projected from the Earth’s centre onto “celestial sphere”, and depicting the Sun’s movement throughout the year, is called the “ecliptic”. The celestial equator and the ecliptic will intersect at two points 180˚ apart at the two equinoxes. At solstice the ecliptic will be closest to one or other of the two celestial poles and are also positioned 180˚ apart.